The Institute For Drivers Safety has provided driving instruction for over 20 years to teenagers and adults. Over 96% of our students pass their driving test on the first try. 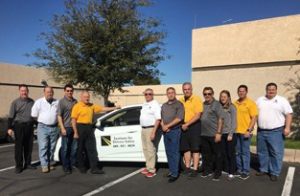 Through our 85+ years of combined driver education experience and 185+ years of combined law enforcement experience, we deliver the definitive, most safe driver education program in the community. We serve Greater Phoenix, Scottsdale, Paradise Valley, Tempe, Ahwatukee, Mesa, Chandler, Anthem, Peoria, Glendale and the entire East and West Valley. Driving is a serious activity that demands responsibility, know-how, and attentiveness from drivers, and we take pride in the quality drivers educated by our school. Fortunately, our certified trainers are skilled in helping even the most nervous of drivers get over their stress and discomfort. In fact, over 96% of our students pass their road evaluation on their first try! We offer classroom training, behind-the-wheel training, road test preparation, and a Road Test Waiver Certificate to take to the MVD for licensing. To create a fun environment for certified trainers and students that fosters valuable learning and hands-on experience. This is a sampling of our certified trainers wide range of experience. Our certified trainers have a combined 85+ years experience with the Institute for Drivers Safety. Plus 185+ years combined experience in law enforcement.